INTRODUCTION: "Things We Didn't See Coming" is a book that I did not see coming so to speak. I just found out it by the mere chance of seeing a copy in the Fiction New Releases section of a B&N and picking it up since the cover was sort of interesting. Next I read the blurb and I thought, ok let me just open it though it's highly unlikely I will be interested since post-apocalyptic fiction is only very occasionally for me, but to my surprise I liked the first pages well enough to browse more and then I started getting mesmerized by its style; I got a copy the same day and the book turned to be another big positive surprise for 2010. It stands at about 200 pages but it packs a lot, so I had the feeling I read a much longer book. Despite its seemingly gloom and doom content the book is entertaining and a very surprisingly pleasurable read. Quiet and with no dramatics, this is more literary sfnal fiction at its best. OVERVIEW/ANALYSIS: Since the book consists of nine sequential episodes in the narrator's life that can also be read more or less independently being complete in themselves, I will follow my general story review format and give a short excerpt and analysis for each. For the first time, Dad is let­ting me help pack the car, but on­ly be­cause it’s get­ting to be kind of an emer­gen­cy. The narrator at 14 on New Year's Eve 1999-2000 and the beginning of the "troubles". The one pure mainstream story, it seems a later addition for the sake of completion but the last story connects back here and illuminates it. The new pills seem to be help­ing. Her eyes droop less. Grand­pa’s not op­ti­mistic, but that’s not news. The true beginning of the book in many ways and partly comic, partly tragic but always excellent. A rain horse is a horse that’s been sen­si­tized to trav­el in down­pours with­out com­plaint. The best story of the book follows the narrator at 23 working for the "land management" agency that evacuates people from the countryside following months of continuous rain; when a mishap happens and he is forced to seek shelter in a seemingly abandoned house, he discovers a mother and daughter that want to be together more then they want to survive. Powerful and with a great twist ending. Mar­go walked off this morn­ing, as soon as the sun start­ed warm­ing up the ground, leav­ing me to dig up some­thing else for us to eat. The narrator is about 26 now in the first of the 3 Margo stories that follow his relationship with a practical girl who is willing to do anything to survive and prosper in the "new world"; here, they are hiding in a desert-like scape after they left the city following a plague, when an infected man happens upon their tent, while Margo had gone on a trek in the morning with their only gun. That could on­ly be her. Set some 2-3 years later in a burnt out town, the narrator is a bureaucrat dealing with the relocation of the dispossessed folk there when Margo and her current boyfriend appear; still "in love" with her, the narrator is willing to follow Margo away, but is she coming or not? I’m on the ter­race of the main cam­pus, in a re­clin­er do­ing my work, the screen propped on my lap, my shirt off. These three stories are the heart of the collection and they are all superb though they lack the power of "Dry Land" to some extent; the narrator has to answer the question: what price is he willing to pay for survival and for love? All I did was ask Jeph if he would help col­lect branch­es for a roof re­pair to­day. Narrator at 36, weary of the world and taking refuge in an isolated commune as security specialist and guardian of the only child alive there, the 14 year old teen Jeph; the first of three shorter, vignette-like stories that deal more with moral questions than with the narrator's place in the world at large; plague, privatized medicine with cures for the cash payers, long waiting lists for the rest; a good story but less polished than the previous ones. This is an era of vi­olence. Several more years passed and now there is another attempt at rebuilding the civilization after a truce in the local wars was "signed"; still idealistic, the narrator goes to ask for a position to help bring normality back and he has to take a test that quickly becomes weirder and weirder; another superb twist ending, but the story would have benefited by being slightly longer. I leave them bad­ger­ing the nurse in the cafe­te­ria. All I want is to ap­pre­ci­ate the vol­cano alone, with­out the whole needy-​crowd thing. The narrator at 40, running a small business as a private tour guide for the terminally ill; here we get more background and a connection with the beginning, while the ending is another superb one. 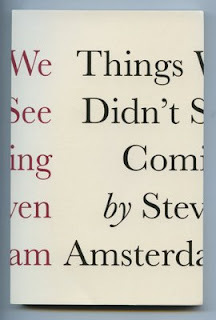 All in all "Things We Didn't See Coming" is a gem of a book that will stay with you for a long time and I strongly recommend it for anyone who wants an interesting but a bit unusual book that is very well written and has an endearing narrator who never loses his humanity despite all that happens. Looks like something I'd read. However, with the summaries of each short story you provided, it seemed like it could be a depressing book. Especially with how the American society is operating today, the future described in the book could very well become a reality, should we continue to disregard the fact the very foundation of our society is cracking under pressure. Cool. I definitely will check the book out! Interesting suggestion. I checked it out on Amazon, read some sample pages and the style works for me. Shame it is not out in paperback yet, I now have to ponder buyunbg in hardcover which I don't like to do for such short books. Wasn't my cup of tea, but was a good read nonetheless. Found it a bit depressing, but unfortunately looks badly like the way life could very well go with everything from climate change, greed, health issues etc. Well written.